Title: Lily Pools. Lady playing violin standing on Victoria pad. Description: Lady playing violin standing on Victoria pad in front of the Linnaean House with audience in background. Picture taken in 1890. Three 5x8 in. black and white prints. See also PHO 2006-2237 and PHO 2006-2245. Negative available at PHO 2006-2265. Title Lily Pools. Lady playing violin standing on Victoria pad. 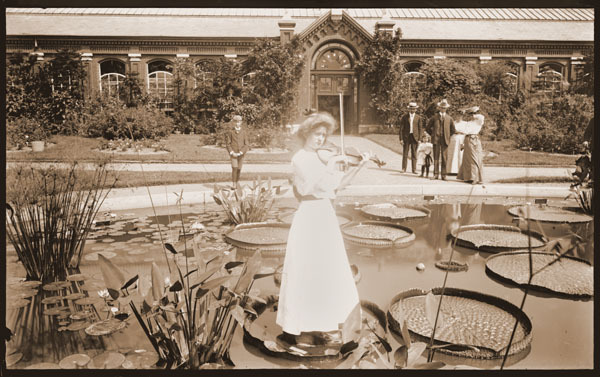 Description Lady playing violin standing on Victoria pad in front of the Linnaean House with audience in background. Picture taken in 1890. Three 5x8 in. black and white prints. See also PHO 2006-2237 and PHO 2006-2245. Negative available at PHO 2006-2265. Width of original 8 in. Height of original 5 in.